The Settlement or septic tank on the left. The BioKube AWTS on the right. Why a two tank system? We hope that you are looking for a system that will give you trouble free operation for years to come? By having a two tank system we can guarantee that the Biokube system will not block and will give you that trouble free system you are looking for. The Pre-Settlement tank will remove all the solids that go down your toilet and just leave the Biokube treatment system to clean up the water that is left. Single tank systems are prone to blocking and the usual reaction from other manufacturers is "You should not have put that down the toilet". We understand that this is not always going to be the case and that things do go down the toilet! The Settlement tank or septic tank is the first part of the system. This can either be supplied by us, or can be an existing septic tank. It is important, if you want to use an existing septic tank, that it is in good condition. We often find that older septic tanks with brick walls allow too much ground water to enter the tank and are just not suitable. You also have to ensure that surface water from the house does not enter the tank. Some old systems combine both surface and foul water and these must be split. Sewage from the house enters the Settlement tank. The job of the Settlement tank is to remove as much solids as possible before the effluent enters the Biokube. The removal of the solids is key to the efficient process performed by the BioKube. It is necessary to have the Settlement tank emptied regularly. (Normally at least once a year.) This ensures that just liquid passes to the BioKube. Click here for our recommended septic tank emptying company who are trained in emptying the BioKube. The BioKube is where the biological cleaning of the incoming effluent occurs. In order to maintain or restore optimal conditions in our waters (streams) we have to reduce nutrients, chemicals and foreign compounds to the environment, which today are discharged with wastewater from the households. The composition of the household wastewater is now more complex than 10 years ago. During the last decade the water consumption per person has dropped significantly. But the low wastewater flow results in a higher concentration of chemicals used for cleaning in the households, which now often include anti-bacterial products. The combination of less wastewater with a higher concentration of chemicals and environmentally foreign compounds, demands an intensified treatment process. 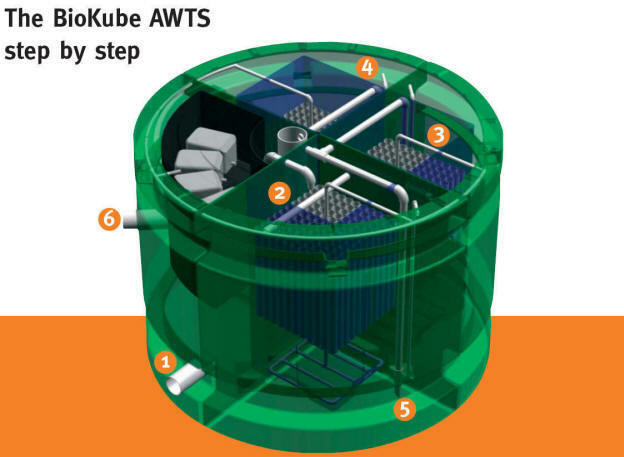 BioKube AWTS is designed to handle such an advanced wastewater treatment process. Inlet to BioKube from Settlement tank (1). 1. Break down of Hydrogen Sulphide. First it is important to prevent Hydrogen Sulphide (H2S) from reaching the AWTS (Aerated Wastewater Treatment System), as this will damage or at best hamper the bacteria needed for the cleaning process in the first cleaning chamber. H2S is always produced by bacteria living in sewage water deficient in oxygen, which is the case in a septic tank. The unique process in the BioKube AWTS (See our patent) makes it possible for it to break down the Hydrogen Sulphide in the septic tank, thus preventing it from reaching the AWTS. The fact that our patented method eliminates H2S already in the septic tank means that the complete system is virtually odour free. Break down of organic material (2). Break down of ammonium/ammonia nitrogen (nitrification) (4). From the clarification chamber of the second section, the water gravitates into the third aerated section. Here we find autotrophic micro-organisms, which break down the ammonium/ammonia nitrogen. This process is called nitrification. From the clarification chamber of the third section, the treated water is discharged back into nature as cleaned. The water is now so clean, that it can be led directly into a lake or stream. You can also use it for irrigation or similar purposes. The sludge, which settles in each section, is pumped back to the Settlement tank (septic tank) several times a day. The settlement or septic tank should be emptied once or twice a year in order to prevent any clogging of the BioKube. Removal of Phosphorus (Optional extra) (6). The BioKube AWTS can be equipped with a phosphorus precipitation kit. Phosphorus is removed by adding Aluminum chloride to the sludge, as it is returned to the Settlement tank thereby creating non-dissolvable salt, which stays in the Settlement tank until it is emptied once or twice a year. Re-use of the purified water. Normally the cleaned water is led to a stream or lake. However, with the Elite models the water is so clean and free from bacteria, that it can be used for irrigation via trickle pipes in your garden. If the cleaned water is used in a sprinkler system, or in areas where boreholes / aquifers exist, we recommend total removal of pathogenic bacteria through ultra-violet sterilization. As the pathogenic bacteria are very low in number, you do not need to add chlorine or other chemicals. A BioKube AWTS is designed so that it employs natural principles for treating the wastewater. In nature, our water streams treat the wastewater. 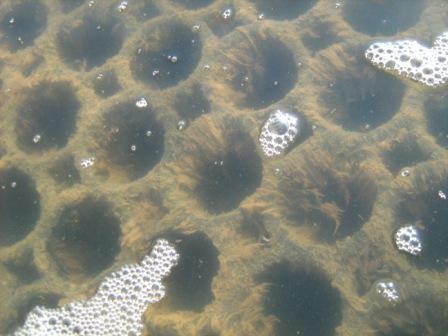 This happens as the water moves and thus is aerated, and thereby is provided with oxygen. The oxygen is used by the micro-organisms, which live on stones and plants in the stream. This enhances the conditions for the microbiology to break down the pollution, which may be in the water. The BioKube AWTS has optimized the sewage treatment process, so that the concentration of micro-organisms, oxygen and nutrients always are in an optimal balance. A BioKube AWTS takes the normal irregularities of the flow of wastewater from an individual or few households into account, e.g. high flows in the morning and in the evening, or no inflow of wastewater at all because the family is on vacation. Irregular flows of wastewater result in a great strain on the micro-organisms during the cleansing process. BioKube’s process control unit balances out the flow of the wastewater over 24 hours. This is done by pumping the wastewater from the inlet-well in small quantities and regular intervals into the AWTS. The micro-organisms are therefore offered optimal operating conditions, and treat the wastewater more efficiently than in any other solutions. BioKube has since June 2004 had independant laboratory tests conducted on water samples from 4 BioKube AWTS every 14 days to ensure that the process is not affected by yearly variations such as winter temperatures below freezing or long vacation periods where no sewage water is produced. BioKube performs yearly service on all installed BioKube AWTS.